This fishing-themed boy’s birthday party has all the trimmings of a bait shop and more. 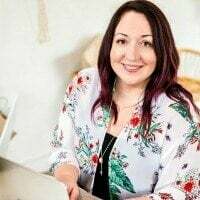 Lauren, from Lauren Haddox Designs, and with help from Angela Marie Events, has recreated a whole fishing experience in her living room, complete with a snack shack. It’s a sea of treats and clever design for Lauren’s boys’ birthday party with cake AND cupcakes. All the blues and sea-evoking colors make this a beautiful party. Here’s the fishing themed party I threw for Sam. I love these budget-friendly fishing party ideas. 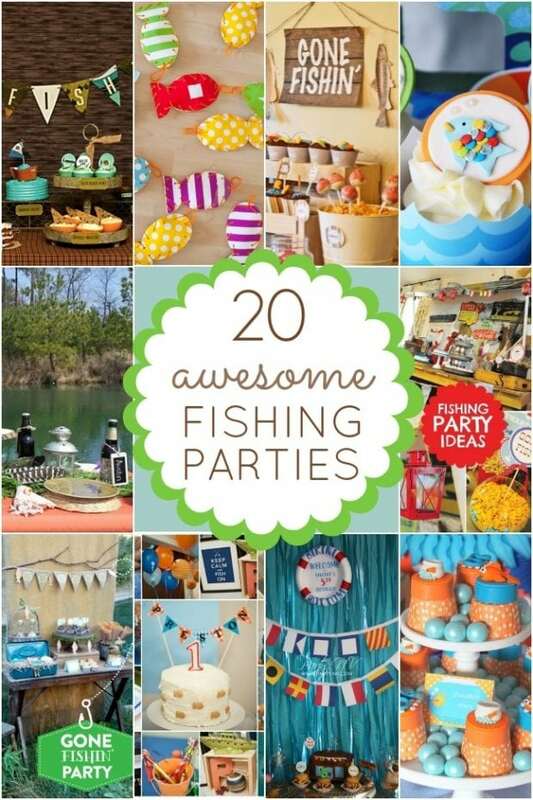 We’ve gathered 20 fishing themed birthday parties to inspire you. Using supplies like tissue paper, gummy worms, some wood, and a lot of creativity, Lauren and Angela gave an experience to “sea” with an adorable fishing-themed boy’s birthday party for all to enjoy. Lauren’s gone fishing party printables helped set the scene for fun. To outfit the bait shop for fishing action, accessories included fishing nets and poles. Lauren thought of all the details; notice the driftwood, an old anchor and an oar, too. Lanterns and multi-colored pennants add to the scene. I love the bait shop sign. Blue tissue fringe served as water, and white, round, Chinese lanterns were painted half red to look like buoys. What’s a fishing party without food though? Refreshments included treats that harkened back to snack shacks on old, rickety docks. Catfish was served in retro plastic baskets, with potato salad, coleslaw and $.25 snack cakes like Ding Dongs and Moon Pies. Cold pop and a drink station with ice tea (“brackish water”), and blue lemonade (“salt water”), refreshed the hungry fishermen. Bowls of Goldfish Crackers needed no bait to be enjoyed and what a fun touch to add blue candy “water”! Mason jars with retro-striped straws made it easy sipping on the ‘dock of the bay”. Everyone was “hooked” by sea-themed cookies of fish, tackle boxes, buoys, and life jackets, while red-and-white buoy cake balls were a catch of the day. Clever fishing-themed activities were in the backyard. Children could “fish” from an old boat to catch burlap fish (Lauren used magnets in the fish and on the end of the fishing line) and go digging for live worms in the Worm Dig box. There was also a fish coloring station. You can tell everyone had a “reel” good time. Get more fishing themed boy’s birthday party ideas with these party ideas.